UPDATE 19/12/2017: Find our new poster image below! Global Game Jam at Farset is back again in 2018, in partnership with Northern Ireland Screen. The Game Jam will run from Friday 26th to Sunday 28th, and is a chance to meet some great people and develop a fun game in a weekend. With a party atmosphere from Friday night, there will be plenty of people there to team up with, create something interesting and, most importantly, to have fun! We ask that you reserve your seat at Farset Labs on Eventbrite, so that we can get accurate numbers for our food, and you can get some nice swag. 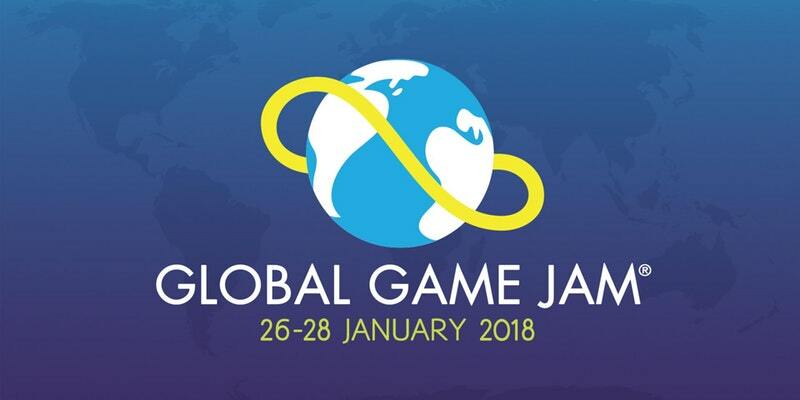 You can then complete your Global Game Jam registration at globalgamejam.org on (or before) Friday 26th January. Tickets this year are £5 each – buying a ticket will reserve your seat for the weekend as well as helping us to provide you with catered meals for the full weekend and a unique GGJ Belfast t-shirt! The game jam’s theme will be announced at 5pm on Friday 26th January so we recommend all participants to be in Farset before that time, or send word if you will be arriving later on. We look forward to seeing you all, as it will be a great weekend! Click to download our event poster below, if you would like to adorn your office/room/comfort-zone with a reminder of what awaits you at the end of January! Please note: You must be over 18 on the 26th of January in order to participate. With additional sponsorship from Belfast City Council. 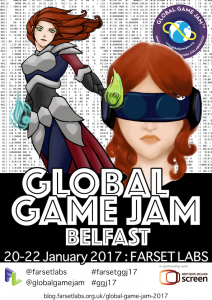 Global Game Jam at Farset is back again in 2017, in partnership with Northern Ireland Screen. The Game Jam will run from Friday 20th to Sunday 22nd, and is a chance to meet some great people and develop a fun game in a weekend. With a party atmosphere from Friday night, there will be plenty of people there to team up with, create something interesting and, most importantly, to have fun! We ask that you reserve your seat at Farset Labs using our Meetup.com page at meetup.com/Farset-Labs-Events – entry is free for everyone! You can then complete your Global Game Jam registration at globalgamejam.org on (or before) Friday 20th January. The event is free, and all meals are catered! The game jam’s theme will be announced at 5pm on Friday 20th January so we recommend all participants to be in Farset before that time, or send word if you will be arriving later on. We look forward to seeing you all, as it will be a great weekend! UPDATE 2016/12/28: You can now download our event poster for #FarsetGGJ17 via the image on the right – print out and keep, or post it up for all to see! Please note: You must be over 18 on the 20th of January or be accompanied by legal guardian in order to participate. More information will be provided in the run-up, but please feel free to contact events@farsetlabs.org.uk or ask us questions via Facebook or Twitter with the #GGJ17 hashtag. 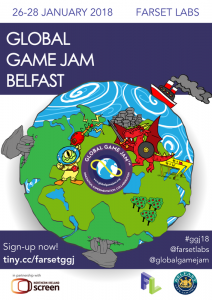 The first Global Game Jam ran in 2009, and this year there are already over 480 individual Jam sites registered around the world, and Farset Labs has been running Northern Ireland’s only public GGJ site since 2013. We will be live streaming video from sites all over the world during the 48hr event. There will also be an opportunity to see and play other teams’ games at the end of the event. The details of the venue are also available on our Global Game Jam listing. Farset friends, Gamecraft, will be back in Belfast on 9th May, holding a day-long game-jam at University of Ulster Belfast on York Street. There are 15 complimentary Gamecraft tickets available to Farset members. For more information and to claim your ticket, check out the member Discourse group. Belfast GameCraft is back; Jam season returns. As the nights close in during October, warm your creative engine with some tasty Game Jam at Farset Labs. Our friends at GameCraft will be returning for a day-long game jam on Saturday 18th October, with a panel of independent game developers judging the winners. GameCraft is a games jam event to build, bind and encourage the gaming community to make their ideas happen. This latest Belfast date forms part of a chain of GameCraft events starting back in 2012 with 120 people producing more than 35 games at the first event; since then it has been hosted in Belfast, Dublin, London, New York, and at huge national games events like Insomnia. The jam is based on a secret theme, announced on the Saturday morning. With that as your starting point, no matter your particular interests or skills, the task of making a game in a single day begins. Anyone who has been to a game jam before can tell you about the excitement of getting started, and the satisfaction of getting to the end – in between are the half-baked ideas that just about work, the quarter-baked short-cuts that work better than they deserve to, and the ages of concentration to get an animation right because it makes the character “just perfect”. It’s a fun ride, and GameCraft concentrates all of this into one day, so there’s none of the crazy-sleepless-zombie-coding seen at weekend jams. Come to have fun! Come to share ideas or just compete! Most of all, come and make games! This is a BYOC event, but Farset can provide external monitors on request. You can find more information about GameCraft, and register for GameCraft Belfast, on their site. Registration is required to take part. Posted on 27/08/2014 30/09/2014 Author GlennCategories EventsTags art, coding, game design, Game Jam, gamecraft, games, graphics, soundLeave a comment on Belfast GameCraft is back; Jam season returns.